If you’re looking for the top places in Washington, D.C., for families, we’ve got you covered with this handy map. From vintage carousels to artsy hot spots, D.C. offers something for everyone. 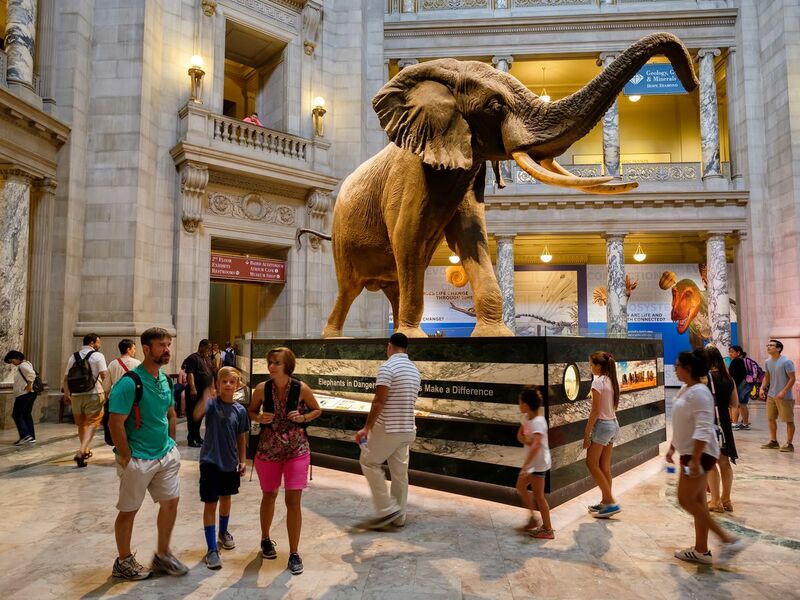 With a plethora of attractions, easy-to-use transportation, and some of our country’s top museums, Washington, D.C., should be on every family’s must-travel list. But determining which sites to see—and what to do when you get there—can be downright overwhelming. We’ve catalogued the most important tourist sites on the National Mall as well as under-the-radar destinations that will have your kiddos pretending to be international spies or kayaking in the Potomac. Whether you’re a longtime local or a first-time visitor to our nation’s capitol, here are the 25 best things to do with kids. Traveling to other cities with your kiddos? Don’t miss Curbed’s maps of the best family activities in Philadelphia, Boston, Detroit, Atlanta, Chicago, Miami, Los Angeles, Seattle, San Francisco, New Orleans, Austin, and New York City. In 2006, Clemyjontri Park became Virginia’s first accessible park, where children of all abilities can have a parallel playground experience. Look for the lowered monkey bars, swings with high backs, and rubber ground surfaces so wheelchairs can roll easily. Founded in 1891, this historic park offers a beautiful vintage carousel and an arts and cultural center with classes, workshops, and performances. Don’t miss the annual Family Day, a kid-centric day of magic shows, storytelling, and face painting. The National Zoo is one of the oldest zoos in the nation—not to mention it’s free!—and it houses everything from cheetahs to pandas to apes. There are also annual family-friendly events like Boo at the Zoo and ZooLights, a must-see for holiday lights in December. Perfect for biking, this 18-mile paved trail stretches from George Washington’s Mount Vernon Estate to Theodore Roosevelt Island. Head over to this map for helpful parking locations, and don’t forget the water. With 1,674 acres, Rock Creek Park is one of America’s largest and oldest city parks, so it’s worth a visit. Start at the Nature Center for ranger-led educational programs, and don’t miss the easy half-mile Woodland Trail for aspiring hikers. This kid-friendly oasis provides a little bit of everything, like a train ride perfect for tots, a carousel, ice rink, dog park, and picnic tables. Sure, it’s a bit farther out of the city than most options on this list, but it’s worth the trek. Ignore the boring name and get ready for a 40-minute tour that covers how U.S. currency is printed. No tickets are required and the fast-paced tours operate every 15 minutes. If your child loves collecting coins or is a budding entrepreneur, this one’s for you. A stunning museum with nearly 400,000 square feet dedicated to exploring the African-American story, this museum is a must-see stop for school-aged children to learn about inclusion, injustice, and tolerance. Sports-addicted kiddos will like the “Leveling the Playing Field” exhibit to learn how sports players fought for equality, while other exhibits teach similar stories through music or fashion. Don’t miss Explore More!, an interactive exhibit where kids can drive an antique car and search for a sunken slave ship. Pro tip: While the museum is free, its popularity means that you’ll likely need timed entry tickets. 20 African-American history destinations in Washington, D.C. Kids eight or older can learn a lot at the U.S. Holocaust Museum. Head to Daniel’s Story, a permanent exhibit that explains the Holocaust from a child’s point of view and don’t miss the end of the exhibit where children can write messages to other visitors about their experience. History moves way beyond boring at this museum, where a collection of three million artifacts are brought to life through top-notch exhibitions. Younger kiddos should head to the hands-on spaces Object Project and Wegmans Wonderplace, while kids aged 6-12 will love becoming inventors at Spark!Lab. Located in the Ripley Center on the National Mall, the Discovery Theater is an interactive experience for school-aged children. You can expect weekday puppet shows, music, storytelling, and even mimes. Head to this Smithsonian museum to see giant dinosaur skeletons, the world’s largest faceted aquamarine gem, and live butterflies and insects. And while older kids will get the most out of the educational exhibits, younger kids shouldn’t miss the hands-on Discovery Room. Visitors at the Main Hall of the National Museum of Natural History in Washington, D.C.
For families that enjoy a bit of intrigue, head to the International Spy Museum. Best suited for kids seven years and older, the interactive KidSpy Zone lets you explore fun games and learn to talk like a spy. Look out for a new location of the spy museum in L’Enfant Plaza in 2019. Hains Point, also known as East Potomac Park, is a waterfront park between the main branch of the Potomac River and the Washington Channel. Enjoy views of the river and plenty of green space and trails for picnics or biking. The massive collection—think everything from Byzantine altarpieces to pop art—at the National Gallery of Art might seem more geared towards adults, but kids can still have a great time. Stop by the Education Studio in the East Building for an interactive guide and hands-on art activities, and don’t miss story times and other family-friendly program offerings. If your kiddo loves to search the sky, this is a don’t miss. 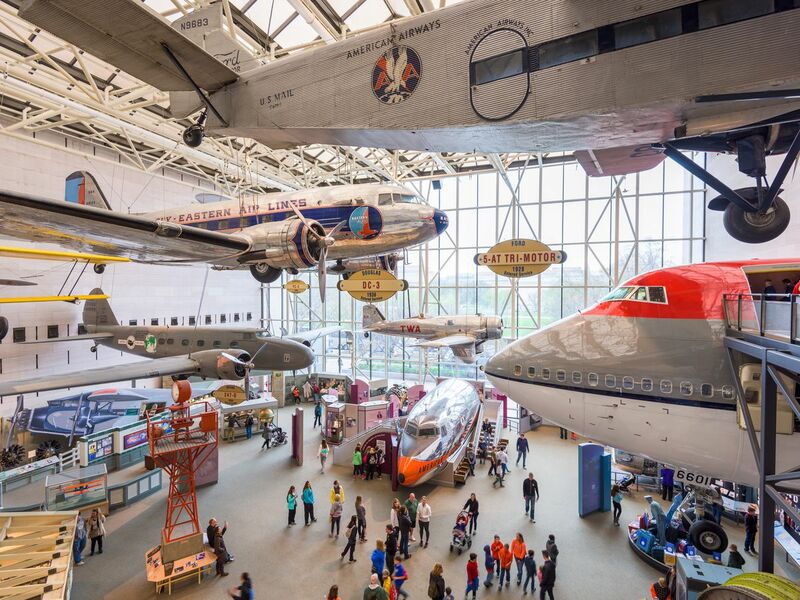 The Air & Space Museum boasts the world’s largest collection of airplanes and spacecraft distributed between 23 galleries. Kids can explore what it’s like to be an astronaut, experience flight simulators, marvel at iconic aviators, and enjoy planetarium shows. An aerial view of the National Air and Space Museum. 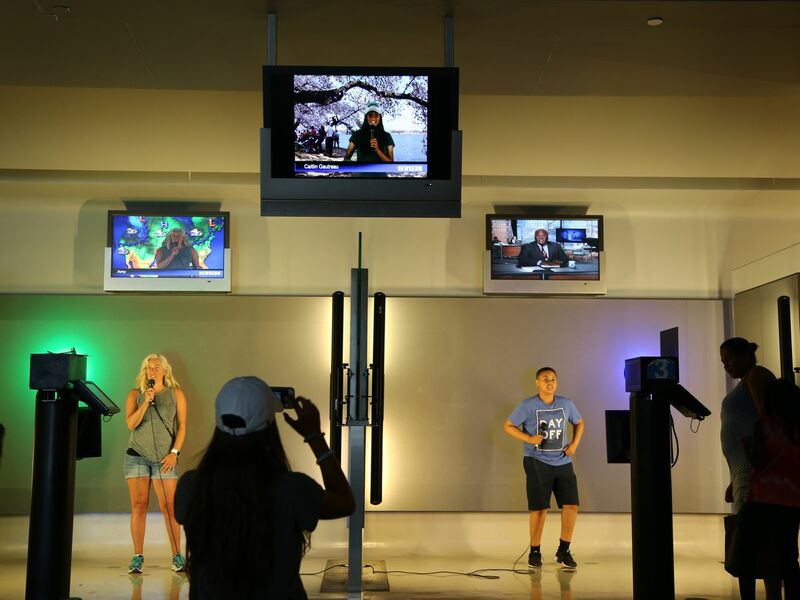 Older kids will love the Newseum, an under-the-radar and interactive museum dedicated to defending free speech and the history of communication. Get ready to become a television reporter, play in a life-like newsroom, and tackle real-life reporting dilemmas to see how journalists adhere to media ethics. An interactive exhibit at Newseum where visitors can pretend to be on TV. 8 places to see the Berlin Wall in D.C.
No matter the time of year, the National Building Museum has something to offer. Every summer in the Great Hall there is a larger-than-life, interactive installation designed by famous architecture firms. At other times, families can enjoy exhibits like the Building Zone, a hands-on introduction to the building arts for those under six. There are plenty of hands-on activities at this top-notch museum; start by diving into ancient cultures at the ImagiNations Activity Center. Kids will have a ball playing drums, listening to a story, and earning badges by playing an interactive quiz show. Time to smell the roses … and pretty much any other flower and plant you can think of. At the Botanic Garden, families can get an inside look at one of the oldest continually operating botanic gardens in North America. In spring and summer, a seasonal Children’s Garden lets kids explore plants in bloom and play with gardening tools. 20 secret gardens and green spaces in Washington, D.C. Kids love getting mail of their own, so it’s no wonder the National Postal Museum is a hit. Check out this kid-friendly itinerary and don’t miss the chance to make your own stamp design or meet Owney the Dog, the mascot of the Railway Post Office. While offering one of the best ice skating rinks in the D.C. area, Canal Park also comes with three acres of seasonal markets, dancing fountains (in the summer), and family events. The Northern Block of the park is perfect for picnics and lawn games, while the Middle Block comes with benches with A/C power for laptops and mobile devices. The Southern Block is also worth a visit if hungry as there are a variety of places for eating. Relax by the water, exercise at the fitness station, or check out the skating pavilion (open in the summer). This is one of Washington, D.C.’s largest parks—and it’s all free—spanning over 1,200 acres, so you’re bound to find a place to unwind without having to worry about crowds. Adults will love seeing the columns that originally supported the old East Portico of the Capitol building and a 390-year-old bonsai tree that survived an atomic bomb. But kids should visit the U.S. National Arboretum for the Washington Youth Garden, a one-acre demonstration garden—complete with a stage and sand boxes—where they can learn about, dig, and even water the plants. Located on the Anacostia River, this waterfront park is perfect for the younger set who want to get active. Families can canoe, kayak, bike, take an interpretive river boat tour, fish off the pier, and explore the many hiking trails. Even in the winter it’s a good spot to stretch your legs on a sunnier day.